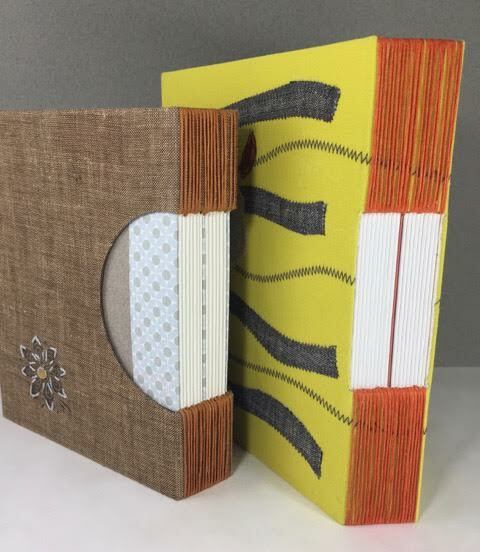 For the September workshop, Lara Cox will be teaching a book binding technique that is a variation of the binding taught in Keith Smith's book Non-Adhesive Binding Volume 1. Having seen this binding on various Pinterest and Bookbinding sites, Lara was inspired to research and make several different versions. She used book cloth over book board covers as well as simpler versions utilizing cover weight paper for the covers. This binding can be glued or not depending on your style choices, and offers endless possibilities for variation. Note: For this workshop she will be using the cover weight paper version. One cover paper: Mi-Teintes, card stock or a similar weight paper, cut 5 1/2" tall x 15 1/2" wide. Cut grain short (grain running parallel to the 5 1/2" side). Feel free to bring decorative paper, colored pencils, etc., with which to embellish your cover. Paper for the signatures: Text weight 8 1/2" wide x 11" tall, cut in half to size 8 1/2" wide x 5 1/2" tall. We will be working with 10 signatures which are comprised of 4 pieces of paper each. Don't fold the signatures until class!! Keep in mind that a portion of the folded sides of your signatures will be visible and you may wish to include colored or patterned papers as the "outside pages" of your signatures. If you choose to do this, you will need a maximum of 10 pages cut the same as your signature pages. Colored thread for binding: Waxed linen or embroidery thread. Note that this thread will show on the outside of your binding and will be a decorative element.